In 1895 Southland's Williamina (Minnie) Dean became the first – and only – woman to be hanged in New Zealand. Her story exposed the stark realities of paid childcare and the lack of choice that many women faced in this period. Dean had looked after children, for a fee, since the late 1880s at her rural Winton home, The Larches. At any one time there could be up to nine children under the age of three in her care. In an era of high infant mortality, it was perhaps inevitable that some of the children would fall ill and die, especially if they were disadvantaged to begin with and lived in cramped conditions. The death of the baby brought closer surveillance. In 1892 Christchurch police took charge of a three-week-old child that Dean had adopted from its single mother for £25. Police traced Dean to a boarding house and found the child in very dirty clothes and being fed from a bottle containing sour and curdled milk. The baby's mother said she could scarcely recognise her child as it had ‘so altered for the worse' in the two days that Dean had looked after it. The police thought that they had probably saved the baby's life. They remained suspicious and kept Dean under surveillance; in 1893, the commissioner of police wrote to the Minister of Justice with renewed concerns about Dean's activities. Events moved quickly in 1895. On 2 May a railway guard saw Dean board a train carrying a young baby and a hatbox. On the return trip he noticed she only had the hatbox, which, as railway porters later testified, was suspiciously heavy. After a fruitless search along the tracks, police unearthed from Dean's garden the recently buried bodies of two babies – identified as Eva Hornsby and Dorothy Carter – and the skeleton of an older boy (whom Dean later claimed had drowned). An inquest determined that Dorothy Carter had died of an overdose of the opiate laudanum, commonly used to calm irritable infants. Sober, home-loving folk from end to end of the country shuddered … when the grim and ghastly story of Minnie Dean's infamy was narrated by the prosecution. Imagine a being with the name and appearance of a woman boldly using a public railway train for the destruction of her helpless victims, sitting serene and unperturbed in a carriage with one tiny corpse in a tin box at her feet and another enshrouded in a shawl and secured by travelling straps in the luggage rack at her head. 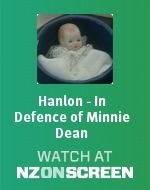 Despite Hanlon's defence that the baby's death was accidental, on 21 June Dean was found guilty of murder and sentenced to death. She was hanged at Invercargill gaol on 12 August 1895, earning the dubious honour of being the only woman ever executed in New Zealand. Invercargill to Winton on the 5 o'clock train. We have 2 events in history, 4 biographies, 7 articles, related to Baby farmers.